It hasn’t been a secret that we are solely responsible to our surroundings’ well-being. A pessimist would argue that one day, it will all fade away, out of our reach forever. Our carelessness and ignorance would eventually ignite a chain reaction that will rattle the very foundation of our lives to a point of no return. Yes, once again the environmental issue comes to play, and not because it is a trend, but because someone actually cares and notices that we are being constantly pushed against our will, as if on a plank ready to hit the bottom of the ocean. However, it is not always the decision makers, which we picked, at least most of us, but it should also be our own agenda to limit the damages that we are making. 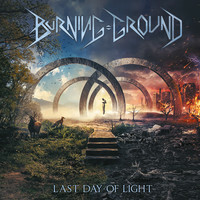 "Last Day of Light", the debut album of the Heavy / Power Metal band from Sardinia, Italy, BURNING GROUND, issued via Minotauro Records, expresses a concern up to the point towards mankind’s last day on Earth. Rather anonymous, the Italians made their point quite clear, and their displayed music is as clear as their theme. Similar to our suggested fate, "Last Day of Light" is a forge of dystopian Heavy Metal, bleak and darkened in its approach. Throughout the album I found various similarities to other bands of the genre such as METAL CHURCH / STEEL ATTACK / TAD MOROSE / ICED EARTH / VALLEY’S EVE among others, in particular the chief element of the riff based songs. BURNING GROUND has been composing riffages that would sound heavy and shady enough to contribute to the album’s theme, partially exploring further with interesting melodic licks, yet not heralding the old British Metal melodious approach, at least not entirely. Even though there is a straightforward sense in the songwriting, there are quite impressive attempts to go beyond the traditional structures, laying down tunes that are fragmented epics with substantial content. Although I was generally intrigued by what I listened to on this album, especially some of the written riffs that for riff lovers it will be a headbanging feast, I felt a bit of a stillness, something that is struggling to be unleashed but restrained, maybe it is the image that the band adamantly wanted to preserve. “Before I See” actually depicts a step forward in the band’s music, which has been based on modernized form of traditional Metal, conveying an atmospheric vibe through acoustics, a determination to add an additional flavor while applying a complex song structure, providing more to the song other than being a mere riff based grinding machine. “Last Day Of Light” is one hell of a basher, displays a main chunky riff, sharing momentum of a modern edge along with several old school elements, quite dramatic in its lyricism and pivotal vocal delivery. “The Killing Hand” displays a unison of both European and US Metal guidelines, between Heavy and Power Metal, a pessimistic gift of traditional heaviness, riff infested with an impressive lead section that seals the deal. “Facing The Shame” portrays yet another bleaker imagery, extreme in form. BURNING GROUND sharing a despondent character of Heavy Metal that smoothly flows, enabling a chance to heed for an inspiring Power Metal song of a higher level. Such an effort is a prospect, and after so many years as an underground band, it was time to come out of the shows for just a little bit to show that there is worth. "Last Day of Light" is consumed by the hard issues, it displays a band that is steadfast towards Heavy Metal while striving to go beyond its reach.